XMM-Newton reached its operational orbit less than a week after being launched by Ariane 5. The satellite was initially injected into a temporary orbit, with a perigee of 850 km and an apogee of 114 000 km, and then utilised its own propulsion system to raise the perigee. ESOC Main control room from which the XMM-Newton early orbit phase was controlled. Forty minutes after the satellite was released from the launcher upper stage, telemetry from XMM-Newton confirmed that the solar arrays had deployed. After checking the satellite's health and its correct orientation, engineers at the Mission Control Centre waited almost one day (22 hours) until XMM-Newton reached its first apogee. At that precise moment they ordered the first of four (eventually five) firings of XMM-Newton's thrusters, four (plus another four for redundancy) small jets using hydrazine propellant. Each boost occurred at apogee, progressively raising the perigee to 7000 km. Meanwhile the telescope tube was emptied of any residual gases (outgassing), the sunshield deployed, and finally the doors of the mirror modules opened. XMM-Newton's operational orbit is highly eccentric (reaching nearly one third of the distance to the Moon) and has been chosen for two reasons. First the XMM-Newton instruments need to work outside the radiation belts surrounding the Earth. These radiation belts are filled with highly energetic particles and extend out to about 40 000 km from the Earth. The radiation of the accelerated particles can cause both damage to the science instruments and false readings. Second, a highly eccentric orbit offers the longest possible observation periods - less interrupted by the frequent passages in the Earth's shadow that occur in a low orbit. In addition, the orbital period of XMM-Newton is exactly two times the Earth's rotation period to maintain optimal contact between XMM-Newton and the ground stations tracking the satellite. This allows XMM-Newton data to be received in real-time and for it to be fed to the Mission Control Centres. 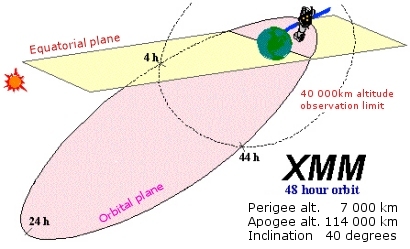 At the start of the mission in December 1999, XMM-Newton's elliptical orbit was tilted at 40° to the Earth's equator, with its apogee in the Southern Hemisphere. At apogee XMM-Newton was 114 000 km away from Earth and moving at its slowest. At perigee the velocity was nine times faster as it passed the Earth at an altitude of 7000 km. The orbital parameters evolve as the mission progresses. As an example, the perigee altitude has varied between 7000 km and 28 000 km, while the apogee altitude has varied between 114 000 km and 100 000 km. Observations by XMM-Newton's instruments are limited to altitudes above about 46 000 km due to the radiation background from the radiation belts. As the spacecraft is below this altitude for about 8 hours in its orbit, roughly 40 hours of each orbit are available for observations. XMM-Newton's science payload is well protected, and during the passes through the radiation belts closed filters are selected in front of the different detectors and the RGS is set to stand-by, as a precaution. XMM-Newton frequently focuses on faint X-ray sources for hours on end - up to 10 or 12 hours at a time - relying on the spacecraft's very high pointing accuracy and extreme stability. "In terrestrial terms, this extreme stability is as if one had a hand-held telescope pointed at a melon situated 150 km away, and were able to see it without jitters" explains Mike Backler. He led the Matra Marconi Space UK team that provided the spacecraft's Attitude and Orbit Control System. This system, which constitutes the 'automatic pilot' of the X-ray observatory, also ensures that XMM-Newton never points towards any bright object in the sky - like the Sun, Earth, Moon and even the planets - which would blind its sensitive X-ray detectors. Ground station at Kourou which, together with the ground station at Perth, tracks XMM-Newton. The XMM-Newton spacecraft is controlled by the European Space Operations Centre (ESOC) in Darmstadt, Germany, using two ground stations at Perth (Australia) and Kourou (French Guiana) to maintain continuous contact with the spacecraft for almost the entire orbit. Three other ground stations, at Villafranca del Castillo (Spain), Santiago (Chile) and Dongara (Australia), are used as back-up. Their antennae also receive the scientific data in real time, which is then forwarded to the XMM-Newton Science Operations Centre (SOC) at the European Space Astronomy Centre (ESAC) in Villafranca del Castillo, Spain, from where it is dispatched to the scientific community.